One day I was reading and I came across this…. 12-13 The disciples said, “Master, if he’s gone to sleep, he’ll get a good rest and wake up feeling fine.” Jesus was talking about death, while his disciples thought he was talking about taking a nap. But THIS is the part that stood out to me. It is here that Thomas pipes up…. Thomas….oh the Thomas we are all warned about being too much like if we have any questions….it was THOMAS who was brave, believing, trusting. Thomas’ faith in Jesus, like all the disciples, was evolving as he was growing in his understanding of just how BIG the presence of Jesus was; of just how much more this Jesus was than what they first understood. And he was willing to follow where this led. So with that knowledge of Thomas’ character and his response to Jesus, I went back to reread those questions that he asks of Jesus later in the gospel. In John 14, Jesus has washed his disciples feet—strange and puzzling but maybe good? They aren’t sure and they still don’t know what’s about to happen. They don’t realize that the fulfillment of everything they’ve bet their lives on will take place in a way that they would never have guessed and will leave them reeling. Jesus is talking about knowing God. He is trying to make something clear. He says cryptically, “I am going to get ready for you. And then I’ll come back. You already know the road I am going to take.” I imagine a pause….a fraught silence….And Thomas asks what everybody is thinking but not saying…”But we have no IDEA where you are going? How are we supposed to know the road?” I love it. I love how I know if I was in that room I would be searching myself in and out assuming that I SHOULD KNOW what Jesus was talking about. I would be berating myself for not understanding—that I should have understood. That I must have missed something. But Thomas is honest. And as we’ve seen before, he is brave and absolutely willing to trust Jesus. He knows there is a method to the madness. So he asks with the honesty that comes from intimacy. And what Jesus answers with is nothing less than himself. To Thomas’ question of “how can we know the road?” he answers, I AM. I am the road. I am the way. I am the life. Its me. You’re looking at it my friend, Jesus said. These eyes, this face, this body. This is it. And then in John 20 we come to that famous exchange between Thomas and Jesus. Jesus has been brutally killed. But there are rumors that he is alive. The disciples don’t believe the women ( who always seem to know things) so Jesus appears to them in a locked room. Thomas wasn’t there. We don’t know why. A friend recently told me that he was at a service this year where the preacher suggested that Thomas was not there because of his unbelief—he must have deserted his comrades and gone back to his regular life and that is why he wasn’t there. This doesn’t jive with me. It doesn’t fit everything we’ve been shown about Thomas. If anything, it would be more likely to me that Thomas was out looking for Jesus, taking the women at their word and trying to find him for himself while the rest of them were afraid in a locked room. At any rate, Thomas missed the big reveal. And he said to his friends, “I don’t know if I get it. I don’t know how this could be unless I see it!” And so 8 days later, Jesus came back—to the same locked room. And as he scanned the room, his eyes went straight to Thomas. He knew Thomas’ question. He knew Thomas’ desire to “get it”-to understand. He knew his need to SEE Jesus. 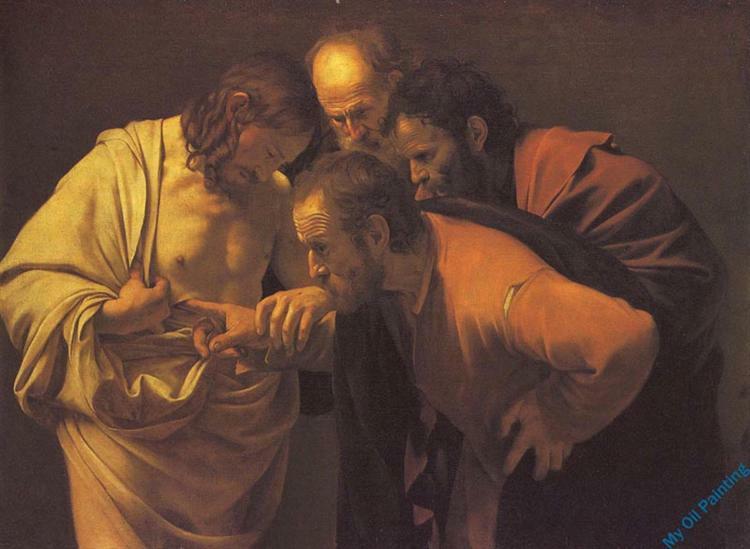 And in the most intimate, revelationary answer, Jesus invited Thomas to TOUCH HIM. No one else got that invitation. To invite someone to touch you is to trust them with yourself. To touch someone else is to give them a bit of yourself. Think of when we invite others to touch us or are invited to touch others….when we make love or give birth or when someone is dying. When we are caring for the vulnerable—children or the elderly, when we make someone beautiful, when we are in pain and grieving. These are the most human and the most profound times. And Jesus led Thomas’ hand with his own to his open side, to his hands, to his feet. I was taught that Thomas’ question was wrong….impertinent….misguided….his faith was a defective one—one that questioned. But for his questioning Thomas received a gift more powerful and profound than any other. He got the risen body of Jesus. When we question we are not being doubtful. We are not wrong. We are thinking, feeling, reasoning creations, making order out of chaos. Sometimes that order is beyond our present categories and so we are told that it is ok to believe—and sometimes we have to take that next step not fully knowing where our feet will fall. But in my experience, and maybe in the experience of Thomas, when we question and are being honest with ourselves before God, we are not left out in the dark. We will not be asked, “how dare you?” We will be answered. And we are answered with nothing less than HIM. His body, his wounds, his face, his LIFE. It is an answer that probably won’t make “sense” in that we won’t be able to write it out in a three point sermon. But we will have to walk it, touch it, look it in the eye and keep following it onto a sometimes road we have not known—and yet know more deeply than we can imagine. And it will take everything we are. Thank you honest, brave, fiercely faithful Thomas for speaking what you felt, not what you ought to have said.